William Ira Boicourt (Bill) went to be with our Lord on July 16, 2018 surrounded by loving family. He was born on August 29, 1935 in Haviland, Kansas to Ralph and Masel (Bearden). He was raised on a farm with his two sisters, Fay and Evelyn. 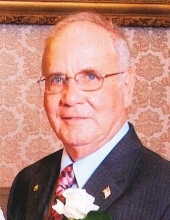 He graduated from Fredonia High School in 1954. He married the love of his life, Elva Mae Cline, February 25, 1956. They spent 62 wonderful years together. They raised 4 children, Sandy Smith (Randy), Michel Moser (Brad), Greg Boicourt (Nancy) and Patty Morrison (Jeff). He was a loving and proud grandpa to 10 grandchildren and 20 great- grandchildren. Bill was active in his community as a member of First United Methodist Church, 4-H leader, Fredonia for Youth and a Sunday School teacher. He was also a CPR Instructor and an EMT. For a living Bill worked at General Portland Cement Plant for 30 years. After retirement, he worked for Hamilton Stores in West Yellowstone, Montana. He also had an aluminum business and was a builder and handyman. Family was the most important part of Bill’s life. He loved them and he was loved beyond measure. To know Bill was to love him. Bill was proceeded in death by his parents and sister, Evelyn Ford. Memorial donations are suggested to the Wilson County 4-H Council and the First United Methodist Church and may be left or mailed to Wickham Family Funeral Home, 510 N. 7th Fredonia, Kansas 66736. Services will be held 10:30 A.M., Friday, July 20, 2018 at the First United Methodist Church in Fredonia, Kansas. The family will receive visitors from 5:00-7:00 pm Thursday evening at the funeral home. Interment will follow the services in Fredonia City Cemetery. To send flowers or a remembrance gift to the family of William "Bill" Ira Boicourt, please visit our Tribute Store. "Email Address" would like to share the life celebration of William "Bill" Ira Boicourt. Click on the "link" to go to share a favorite memory or leave a condolence message for the family.